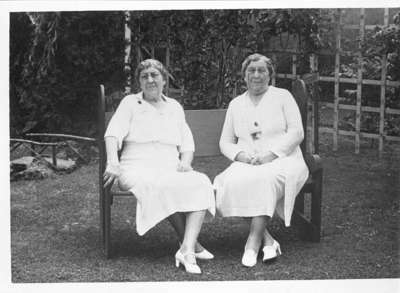 Black and white negative of a photograph of the Pringle sisters on the occasion of their 75th birthday. Harriet Wilson (nee Pringle) is on the left and Mary Esther Cormack (nee Pringle) on the right. They are seated in wicker chairs in a garden. 75th Birthday for Harriet and Mary Esther Pringle, Marjorie Ruddy. Whitby Archives 19-020-001.